We have already discussed at length about the link that joins religion and Freemasonry with catechisms, numbers and symbols. The concept itself of ‘Landmarks', an apparently ‘true British' expression, has biblical origins, therefore Hebrew, like most of the main Masonic and religious symbols in the West. We have already discussed at length about the link that joins religion and Freemasonry with catechisms, numbers and symbols (see Masonic religiosity 1/2/3). The concept itself of «Landmarks», an apparently “true British” expression, has biblical origins, therefore Hebrew, like most of the main Masonic and religious symbols in the West. Landmarks are "merestones" that mark a space. 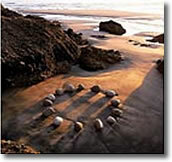 In the esoteric-religious view the circle of stones separated a space that contained a sign suitable to become homogeneous with the sacred in order to defend it from the rest, inhabited by demons, animals and uncultivated men. In Job 24/1 is written: «Why aren't times laid up by the Almighty? Why don't those who know him see his days?». 24/2 «[…] There are people who remove the landmarks…». In Proverbs 23/28 is written: «don't move a landmark from a long time ago, made by your ancestors…». In Deuteronomy 27/17 is written: «Cursed be he who removes his neighbor's landmark…». The reformer of modern Freemasonry, the Anglican priest James Anderson, clearly wanted to cover with a veil of inviolability the new codes he wrote, after burning the previous ones, perhaps because they were too close to the Catholic faith. The historian L. Pruneti wrote: «The introduction of Landmarks is due to Anderson […] who certified their intangibility, although he didn't list them…». Well, it is strange to state the intangibility of something that doesn't exist yet. But the historian Pruneti continues: «…the quotation was only a rhetoric expedient and the attempt to find them would be foolish […] it is possible that Anderson referred to fundamental as well as abstract suppositions, related to an initiatory sphere beyond which the need for written documents stopped existing…». The statement of the intangibility of the "nothing" allowed many interpretations. Some were soon abandoned, perhaps because they were too advanced (see Esoteric Landmarks). Others were incorporated in a seething of changes up to a finally agreed draft. Their intangibility was introduced in the general Statutes of Freemasonry published in 1820 by the Grand Orient in Naples.